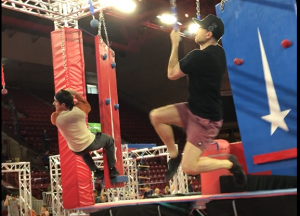 Anyone who has watched American Ninja Warrior at all has heard of the Wolfpack. It’s a small group of rock climbers who trained together in Denver, Colorado. As individuals, they were doing well, but once they all started training together, they exploded onto the American Ninja Warrior scene. 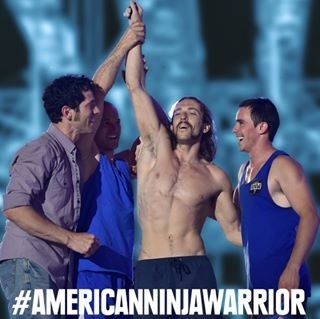 Brian Arnold went further than anyone in Season 5, Meagan Martin got up the Warped Wall the same season as Kacy, Ian Dory is extremely talented and was my pick to go the furthest in Season 7 and I’m sure you’ve heard of Isaac Caldiero who was the first competitor to win the American Ninja Warrior prize. 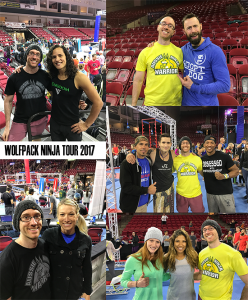 So when the founder of the Wolfpack (the NinjaDoc) announced they were creating a tour, I grabbed one of the last VIP tickets and booked a flight to Colorado. I thought I would have a couple of hours to catch up on work when I first rocked into Denver on the Friday night. Nope! Catapulted straight into a meet ‘n’ greet where I spent a couple of hours talking to a heap of American Ninja Warriors that I’d seen all over the TV over the last 8 years. Everyone was so nice and super generous with their time. Geoff Britten had the biggest smile as he introduced himself and shook my hand but all I could do was stare at his forearms. Did you know that Denver gets like 300 sunshiney days a year? Yeah, I think it’s the same as dropbears and hoopsnakes because even though it was almost summer, a total snowstorm hit us – it was so weird and spectacular and awesome and I got so lost literally every time I left the hotel. Later the VIPs got to check out the course early (couldn’t touch it though) and again chat to a heap of famousy ninjas. I spent a chunk of time with the Ninja Godfather himself David Campbell who didn’t even appear to be freaked out as I kept casually bringing up things about him normal people shouldn’t have known or remembered (in my defense, I had just been watching him smash the Ninja Bootcamp in Season 2). You could have powered the whole city of Denver purely on the excitement in the stadium on the Saturday. Everyone was either waiting to run the course or practicing/training/playing on the obstacles either side of the course. It was a smooth setup, kids stuff and kids classes on the red right side and really hard adult obstacles on the blue left side. The course itself was genius. 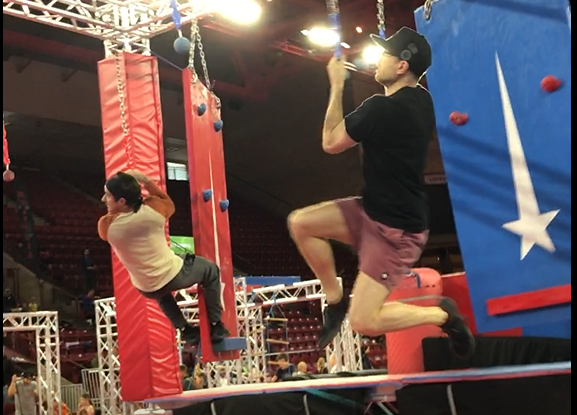 I’ve been to a few comps, and after each run there is always a heap of resetting (putting the salmon ladder bar back, anything that slides has to be put back in it’s starting spot, etc) but this course was completely good to pump people through AND you could race other ninjas side by side! So good! The organisation though was a bit frustrating as the staff had to run bits of paper between officials and everyone was confused about when they’d run. One of our new mates stayed near the start so he didn’t miss his turn, totally amped but unable to do anything or warmup for like an hour, whereas I just happened to be walking past when they called my name, super not ready, I thought I had another 20 minutes. The course was really fun and I ran against fellow Aussie Olivia just to take the pressure and nerves off each other, which totally worked for me cos everyone was all the distracted as she promptly fell off the course. It sounded like a spectacular smash but she was up and laughing in micro-seconds. I got 1:13 on my first run which I was really happy with until I saw people clocking in the 50s and then the 40s. Jon the Giant sped in at like 34 seconds which blew everyone’s mind. I later learned that we were all competing to get into the finals. Only the top 16 amateurs would make it in, as would only the top 16 pros (super great athletes, most of whom had been on ANW). The finals was a big spectacular stadium show – I didn’t initially realise this, I thought it was a comp. Everyone got 3 chances to get their best time to break into the finals. It was fascinating seeing how strategic people got. One buddy posted a good time and was only going to run again if he started to drop out of the 16 while others were planning each foot placement and hand hold. Again everyone was so friendly and there was a general feeling of joy in the stadium. My partner was making way more friends than I was as she became everyone’s expert iPhonographer. I spoke to heaps of Ninjas who were all really excited to hear about Australian Ninja Warrior… we truly felt we had friends all over the stadium. My plan was to hit Sunday as soon as it opened to warm up and get a good time on my remaining two runs. I actually wasn’t aiming to get into finals, because I didn’t really understand that was a thing when I booked flights out that afternoon and so would miss the whole finals shebangabang. Unfortunately my plan was the exact same as every single other person’s plan. Fortunately though, The Wolfpack Tour organisers massively fine-tuned their processes and equipment and the Sunday ran like a dream. Being a businessy IT nerd, I was so super impressed. They legitimately corrected all of Saturday’s problems overnight, it’s such a common saying, but who honestly pulls that off. These guys! I was going to warm up, run for feel and then run again for serious to get my best time. I posted 1:03 on my second run, a great improvement but I was in agony as my tendonitis hit hard and turned both arms into claws of fire pain. Sucked. I’ve now learned that for this sort of thing, I personally can’t do consecutive days… which is fine, lesson learned. 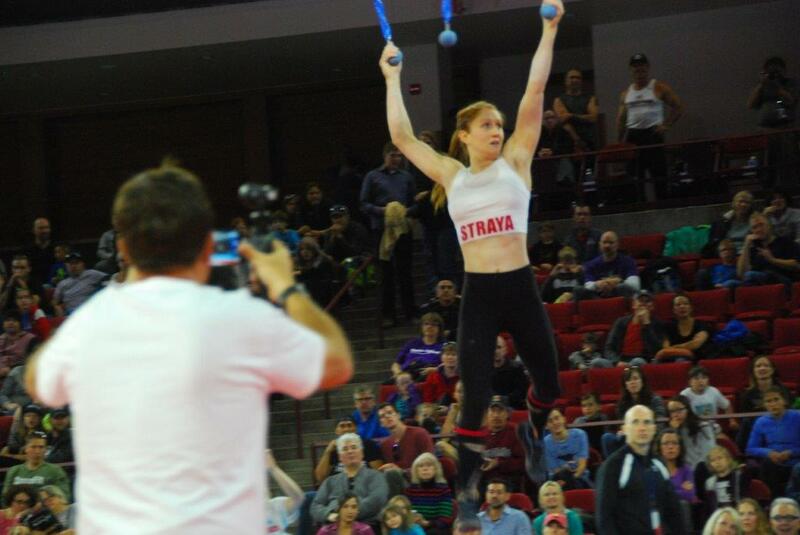 Instead we all turned cheerleader for Aussie Olivia who posted the best female amateur time, by like 20 seconds. By the finals her time had been bested but she was still well and truly in. 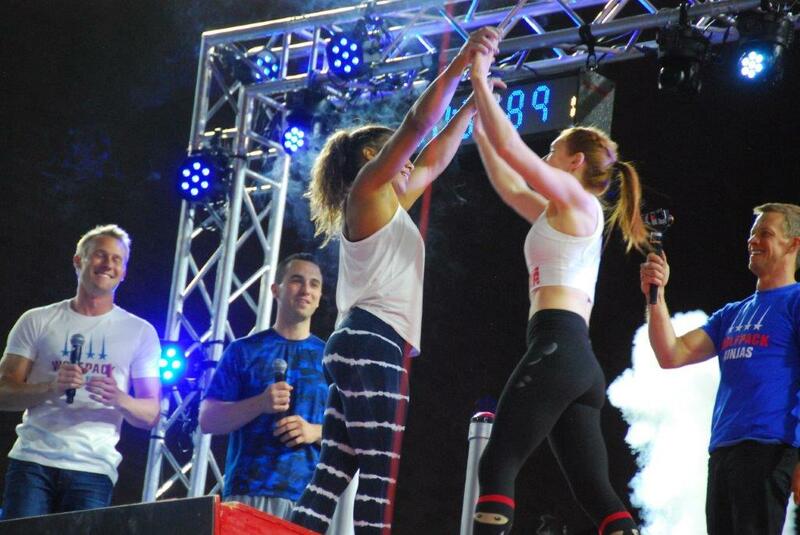 The finals was a series of head to head competitions, with the winner continuing onto the next round until only one man and one woman remained. We stayed as long as we dared, and what we saw was spectacular, the stadium was full, the energy was real high and the competitors were fast. Like real fast. They ran the young girls first, and these tiny chicks were fearless. They interviewed the little girl that won and she made me laugh so much, “How did you do that so fast?” “I dunno”, “Do you have any advice?” “Yeah, just follow your dreams because anything is possible” – ridic adorbs. We had to roll out, but we kept getting updates. Olivia stomped through the first couple of runs but eventually got done by the SheWolf herself Meghan Martin. Look at this race between Drew Drechsel and Joe Moravsky – how is any of that even possible? I always loved all of these guys, but these acts of controlled falling are just so impressive, inspiring and like, totally daunting to go up against. OH MY GOD! WHAT JUST HAPPENED!!? All in all, the Wolfpack Tour was an incredible experience and even weeks later I feel so super lucky that I got to go. I would absolutely recommend. Everyone there really wanted it to succeed, I’m hoping it does well enough to travel to Australia. Seeing all the kids so excited to take classes with their favourite ninjas was super cute. There wasn’t a single child there that wouldn’t have fallen instantly asleep in the car ride home. The next tour is 3rd to 5th of November in Colorado AND cash prizes have been smashed up to $50,000 USD (from $30,000). That’s nearly enough for a deposit on crushed avo on toast. The Wolfpack Den is going to be opening on the 22nd of July just outside of Denver, Colorado. Looks like they might have a course permanently set up, which is actually kinda rare for Ninja Gyms. Check out their WolfDen website if you can swing a trip to Colorado in the US sometime soon. ← Tuesday – All the pains. All of them.